Arqueologistas teorizam que os primeiros povos a habitar o Yukon cruzaram uma ponte terrestre da Ásia durante a Era do Gelo, entre 10.000 a 25.000 anos atrás. Na primeira metade do século 19, os Europeus entraram em cena com o comercio de peles. Exploradores e comerciantes da Hudson Bay Company desciam o Rio Mackenzie, estabelecendo postos de comercio ao longo do caminho. Tabaco, armas e outros produtos de origem europeia eram comercializados com as First Nations (nações indígenas). A maioria das nações indígenas continuaram seu sistema nômade de subsistência e estilo de vida durante este período, incorporando a caca por peles e sua comercialização. Em 1942, mais de 30.000 integrantes do Exercito Americano chegaram ao Yukon para a construção da Alaska Highway. Juntamente com a estrada, pistas de pouso foram construídas para transportar suprimentos de guerra para o Alaska. Quando a estrada foi finalizada, a maioria dos Americanos saíram, mas a estrada mudou o território para sempre. Os povos indígenas que haviam vivido ao longo dos rios e lagos, mudaram-se para as comunidades ao longo da estrada. A população permanente do Yukon quase dobrou em numero e continuou a crescer durante os anos 1950-1960. A maioria da atividade econômica do território estava concentrada em Whitehorse, assim a capital foi transferida de Dawson City – ao norte – para Whitehorse – ao sul- em 1953. Archeologists theorize the first people to inhabit the Yukon crossed a land bridge from Asia during the Pleistocene Ice Age between 10,000 to 25,000 years ago. In the first half of the 19th century, Europeans entered the picture with the fur trade. Hudson’s Bay Company explorers and traders travelled the Mackenzie River, setting up trading posts along the way. Tobacco, guns and other European goods were traded with the Yukon First Nations people. Most of the first Nations people were able to continue their semi-nomadic subsistence lifestyle through this period, incorporating trapping and trading into their yearly rounds. In the 1870’s, with the discovery of gold, thousands of “stampeders” made their way north. By 1898-99, Dawson City, at the junction of the Yukon and Klondike rivers, became home to 40,000 people and grew into the largest city west of Winnipeg. Though many made fortunes, few newcomers arrived in time to stake claims. 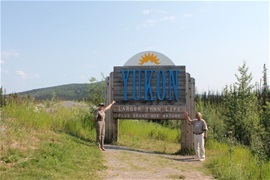 In 1942, more than 30,000 U.S. Army personnel arrived in the Yukon for the building of the Alaska Highway. Along with the highway, airstrips were built to transport war supplies to Alaska. When the highway was complete, most of the Americans left, but the highway changed the territory forever. Sternwheelers became redundant and the First Nations people who had lived along rivers and lakes moved to communities along the highway. The permanent population of the Yukon had nearly doubled and continued to increase during the 1950’s-1960’s. Most of the territory’s economic activity was centered in Whitehorse so the capital was moved south from Dawson City in 1953. Today, under the watch of the 24 hour sun, Yukon hosts stellar races, often attracting thousands of competitors, like the Klondike Trail of ’98 International Road Relay, Light Mountain Bike Festival, or paddle in the Yukon River Quest Canoe and Kayak Race.